Who doesn't like blueberries and cashews? And together, they're even better - at least in my opinion. 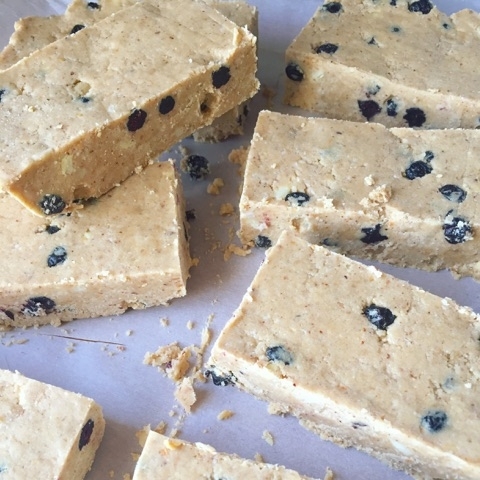 These bars are the best for your busy week, traveling, eaten as a healthy treat, or wrapped up in some parchment paper and tied with twine to gift to a friend - everyone will love these protein bars! In a large bowl, mix together all of the dry ingredients. Set aside. In a separate bowl, combine the cashew butter, almond butter, and vanilla extract. Then in a small bowl, melt the coconut oil and honey. Add the wet ingredients to the bowl with the dry ingredients. Using the spatula, mix everything until it is fully combined. Note: I found that using the spatula to press the ingredients against the inside of the bowl made it easier to fully combine the mixture. The end result will be dough-like. Line a 9x9 baking dish with parchment paper. Scoop the bar mixture into the dish and, using the spatula, make the dough even by gently pressing it into the dish. Place into the fridge and let chill for a minimum of 5 hours. Once chilled, use a sharp knife to cut into squares (3 cuts one way and 4 cuts the other way creates 16 squares). Take the bars out of the baking dish and store in the fridge in an air tight container. Enjoy a bar right away or later. Notes: To make these bars vegetarian, substitute the collagen powder for 4 Tablespoons more of the pea protein powder instead, or whatever protein powder you used while making these bars. To make vegan, do the same thing you would to make them vegetarian (listed above), but also substitute the honey for 4 Tablespoons of agave nectar or maple syrup.